The following profile on angler/advocate Capt. Tred Barta was published in the March 2013 edition of Making Waves and was written by Gary Caputi. “I’ve known Tred for at least 30 years,” said RFA Executive Director Jim Donofrio. “When I was a captain his accomplishments in the canyons off Long Island were already legendary. Later he became a member who contributed a lot of time and effort to our work at the RFA. Whether you like him or hate him for his outspokenness or believe he is all bluster and self-promotion I can assure you Tred is the real deal! So Just Who is Tred Barta? Captain Tred is a throwback to another era and a pioneer of our times all rolled into one—an outdoor sportsman, blue water fisherman, rancher, hunter, television personality, author, and multiple world record holder as a fisherman and hunter all punctuated by his flamboyant optimism and never-ending energy. He grew up in Southampton, NY on the eastern end of Long Island where the beaches, bays and ocean were his playground. He attended the University of Colorado where he raced Alpine and Nordic ski combined. He is a fierce competitor and won the Junior Biathlon Championships, after which he trained with the U.S. Olympic Biathlon Team. Most of you know him from his longstanding column in Sportfishing magazine, his in-depth instructional features for the Big Game Fishing Journal, from his book—The Best and Worse of Tred Barta—and from watching him on his popular NBC Sports network television show of the same name. Everything he does is full throttle, straight ahead, the hard way, the Barta way, with a decided preference for always amping up the degree of difficulty. For example, while most bow hunters today favor high tech compound marvels Barta shoots a classic long bow similar to those used by English archers in the Middle Ages and the plains Indians of the Americas two centuries ago. Captain Tred first came to national prominence as an offshore fishing phenomenon. He is recognized as one of a handful of modern-day pioneers of canyon fishing along the East Coast. 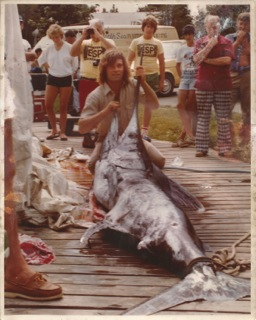 He was instrumental in developing and perfecting many of the techniques now commonly used in the sport not the least of which was utilizing ocean surface temperature and warm core eddies as key locators of tuna and billfish. He developed and mastered techniques for finding and fishing ocean current generated hot spots, skills honed by countless days and seasons offshore in the canyons. Along the way he is credited with having caught more elusive bigeye tuna on rod and reel than any man alive. Barta is a light tackle record holder extraordinaire having held as many as a dozen IGFA line-class world records. He is the only person to hold what he affectionately calls “the triple crown of light tackle tuna records,” a 65-pound yellowfin on 6-pound line landed after 3 hours of solid effort, a 63-½-pound bluefin tuna on 12-pound line, and a 215-pound bigeye tuna on 20-pound line landed in 5 hours and 17 minutes – still unbroken after 20 years. He is also an accomplished fly fisherman having used the long wand all over the world. His 38.6-pound dolphin on 6-pound tippet record is still the mark to beat in the record books. His accomplishments as a hunter are no less extraordinary and far too long to list, but if you like to know more check out www.tredbarta.com. In more recent years Tred has been a teacher, educator, conservationist and an unflinching advocate for saltwater angler rights. But it was a dark event in his life that led Tred to become an inspiration for us all. His encounter with a rare spinal condition and the spirit, determination and unrelenting optimism he has shown in dealing with the resulting physical handicap that has made him a hero to millions. 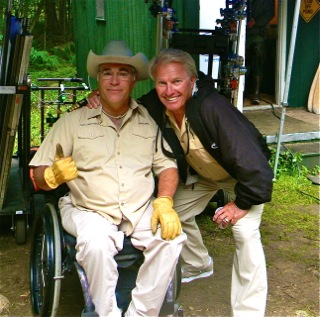 In May 2009 Tred suffered a spinal infarction (stroke) caused by Waldenstrom’s blood cancer which left him paralyzed. Tred’s desire to do things “the hard way, the Barta Way” and “never, never, ever give up” would be challenged as never before when he faced the consequences of a physical condition that could humble even the strongest among us. It tested him in ways he could have never imagined, but through it all he remained resolute and indomitable. He would not only survive, he would thrive finding new ways to participate in the outdoor life he loves with a deep and burning passion. Barta has never been a spectator and he had no intention of becoming one no matter what the physical handicap. Paralyzed from the armpits down he worked constantly to strengthen his body. When the doctors said he couldn’t he consistently proved them wrong. With his strong faith in God and the support of his number one hero, his wife Annie, and good wishes from thousands of fans he adapted. Today he continues to hunt with the longbow and still pursues and catches billfish. Setting new light tackle records is still high on his priority list. In a recent phone conversation Tred had a lot of things to say about his journey in life, the situation he has found himself in and his future involvement with the RFA. “There is a tremendous amount of white noise surrounding fisheries conservation and management issues,” he said. “There are so many groups doing good things, all running around in different directions with huge amounts of money being spent, but so little is devoted to where the real issues lie, the very place where the RFA stands heads and shoulders above all the other organizations and groups. Never doubt Barta when he makes a commitment. He raised $1 million for the IGFA Junior Angler Program and $800,000 and counting for the Barta Boys and Girls Clubs of Coastal North Carolina in the past. Now he is turning his sights, his talents and his network of friends and sponsors throughout the sportfishing industry to the task of repeating the goal for Recreation Fishing Alliance. Read this story and more in the March 2013 edition of Making Waves exclusively from the Recreational Fishing Alliance.